Internal corporate strategy—which must address the issue of how international firms need to strike a balance between global standardization of their products and processes and the benefits of local adaptation (while at the same time deciding what decisions to centralize and which to devolve to foreign subsidiaries). External global strategy—which much address the challenge of how multinational companies need to manage global pressures they are forced to deal with, such as corporate social responsibility, activist groups, non-governmental organizations (NGOs), governments, and multilateral agencies that push the firm in directions it may not otherwise pursue while also managing cultural differences. Both concerns—internal strategy and management of external relations—are connected by the fact that the world is fragmented into about 200 nations exhibiting a huge variation in income, culture, language, and government. International Business involves the management and utilization of these differences across countries. The world remains fragmented and very unequal. The multinational corporation wishes to operate on a global scale, with as few impediments as possible in order to take advantage of global scale and scope. But political entities—countries—draw lines called borders, within which rules, institutions, culture, and income (purchasing power) are often different from those of their neighbors. (Per capita annual income ranges from more than $100,000 to below $500 per person, with as many as 66 nations whose residents’ average income is below $3,000 per year). Internet traffic has seen phenomenal growth, from 16 million users at year-end 1995 to 3 billion in 2014: 40 percent of humans are now connected. However, cross-border traffic remains below 20 percent—and that percentage is dropping as “within country” links are growing even faster. There is no “global village,” but rather a series of spatially dispersed villages that are (only somewhat) internationally connected. Not too long ago, IBM specified a dress code for its office employees worldwide—a white shirt and tie. (IBM had relatively few women employees then.) IBM prided itself on its ability to replicate, in foreign subsidiaries, the standardized technology, protocols, and procedures it had developed at home. Moreover, the company believed a computer is a computer anywhere on the planet. Twenty years ago, companies saw considerable advantage in developing an efficient model in their home country (often after considerable research and development [R&D] outlay) and then reproducing that model in worldwide operations. The additional costs of local adaptation—to each country’s tastes or requirements—were not seen as worth it. In its early days, MTV simply used material produced for the US market in foreign TV stations. Indeed, there are powerful arguments for replicating a standard template worldwide at lower cost than trying to tweak it—or trying to come up with a new design for each nation. But what if the benefits of local adaptation (such as greater viewership or increased sales in each nation) are higher than the costs of local adaptation? MTV found that while it is costly to develop local talent and video content, these costs could be more than recouped from higher viewership and advertising revenue in many local cultures. IBM found that the computer hardware business fragmented or modularized into individual user PCs and that customized IT consulting—country by country, based on each nation’s organizational styles and requirements—was more profitable than the hardware end of their business. Today, hardware is below 10 percent of IBM’s global revenues. To be sure, the allure of standardization and replication of a standard model across borders remains a powerful argument. Auto companies prefer, whenever possible, to have a standard car design sold across several or all nations, which would enable the firm to add economies of large scale, lower design and R&D costs, reduce inventories, and negotiate even larger-quantity discounts from component suppliers. But road conditions, regulations, and cultural preferences vary considerably across countries. A suspension that works on Germany’s smooth roads may fail in India. Emission standards are not uniform. In low-labor-cost countries, where chauffeurs are easily hired and prestige dictates that the car owner be driven sitting in the back seat, companies such as BMW and General Motors have found that short leg room in back seats is a deterrent to sales. Such cases present considerable temptation to do additional R&D and retooling and come up with local or country-specific car designs. A key issue in international management, therefore, is the art and strategy of picking the optimum balance between one extreme of complete worldwide standardization on the one hand, and the other extreme of adaptation for each country market, as described in my article “Globalization: What the Heck Is It?”, which gives an analytical approach to finding the optimum. For an astonishingly wide range of products and services—from consumer products such as cameras, to industrial goods such as servers, to services such as consulting—companies do not charge the same price for the exact same item. A year after Apple launched its iPhone5, its official list price in Apple stores (and authorized retailers) exhibited a greater than 50% variation—$649 in the highly competitive US market, $791 in Hungary, and a high of $1,005 in Brazil. A camera sold for $300 in the US may go for $175 in Thailand and more than $500 in Switzerland. The price of the same drug in an emerging nation can be less than 10 percent the cost in the US. A prescription for Plavix® that would cost a patient $152 in the US (where pharmaceutical company competition is weakest) would in the UK cost only $57, and generic equivalents in India retail for under $3. Indeed, according to economics theory, companies would be sub-optimizing on global total profits if they charged the same price everywhere. Recall the context of international business: there are 194 countries that have a huge variation in disposable income, culture, regulation, and intensity of internal competition. Each country is a separate fragment of the world to the marketer. And some “gray market” (parallel market) leakage across borders notwithstanding, customers in each nation buy locally at the price the multinational sets (see below). In an affluent nation such as Switzerland, a firm would be unnecessarily giving up profits by setting camera prices low. The Swiss can afford it. For a regulated pharmaceutical industry in the US, with strict enforcement of patents and affluent customers covered by insurance, US drug prices are the highest in the world, and the large US market enables drug companies to recoup their frighteningly high R&D costs. By contrast, competition in the US mobile telephony business is intense, and firms such as Apple are forced to set prices for American consumers of mobile phones that are among the lowest in the world. Prices for many products in emerging nations are set low simply because otherwise there would be no buyers. (A low price does not necessarily mean no profits as long as the low price is still above variable cost. See below.) For cameras and consumer electronics, Americans pay below-global-average prices with multinational companies setting even lower prices in emerging nations where income levels are not high. The task of the international marketing executive is to calculate, using market research and econometric models, the “optimum price” that maximizes profit in each country. However, then the firm has to be prepared to face the problems of accusations of “dumping” in some countries or price gouging in others, possible bad publicity, and the nuisance of “gray market” leakage. A drug prescription that wholesales for $100 or $1,000 may often have a direct manufacturing cost of less than $2. So for a $100 revenue, is there an “obscene” profit of $100 – $2 = $98? No, the $98 is not profit, but a “margin” above the cost of manufacturing alone. Out of the $98 margin, pharmaceutical companies have to support marketing, distribution, and above all the R&D cost of drugs. The industry’s association, PhRMa, puts the average cost of developing and launching a new drug compound at $1.3 billion each. Other breathless and improbable claims suggest a figure of $5 billion. More tempered academic studies suggest lower figures in the hundreds of millions, although secrecy and sheer accounting complexity mean that very few data are actually made public. Suffice it to say that medical R&D costs are high and that the odds of a compound being approved by the Food and Drug Administrations (FDAs) of nations are very low. Hence, the costs of hundreds of failed R&D efforts have to be sustained by the one successfully launched drug. Pharmaceutical companies already have higher R&D/Sales ratios than most industries could tolerate. Importantly, the outlay on R&D (for the few successes and many failures) has to be recouped in a short patent life of 20 years or less. So the largest fraction of the 98 percent gross margin ($100 wholesale minus $2 manufacturing cost) is put back into the R&D pot. But this is true not just for the drug business, but for most high-technology companies. One criterion I propose for a “high-tech” company is a “High Ratio of Fixed Costs over Variable Costs.” Take semiconductors as an example. A semiconductor fabrication factory can cost $3 billion to set up. In addition, each new semiconductor design may cost millions in R&D. But once these fixed costs are incurred (i.e., treated as “sunk costs”), then the incremental cost of producing a chip may only be $10. A pharmaceutical firm may spend $300 million of R&D for a drug. But once that cost is incurred (sunk), the incremental or variable costs of manufacturing the drug may only be $2 per dose or prescription—trivial by comparison. Musicians and filmmakers may toil for years on their creative output. But the variable or incremental cost of producing the CD or DVD is only $0.50. What does a “High Fixed Cost/Variable Cost Ratio” do for a multinational firm? It enables it to play the game of international price discrimination. A new movie release retailing for $17 in an affluent nation may be sold—at an official, company-set price—of only $4 in a poor emerging-country market. The official or company-determined $17 price in the affluent nation and the official $4 price for the same movie in a poor country are optimal for each of those markets. The millions spent on producing the movie and the master digital files are already gone—sunk costs. The $17 price over the variable cost to produce each 50-cent Blue Ray or DVD disk (or to stream the download) equals $17.00 – $0.50 = $16.50 “contribution margin” to be applied toward amortization of the millions spent on producing the movie. But even the official $4 price in an emerging nation yields a contribution margin of $4.00 –$0.50 = $3.50. Better to earn the $3.50 margin in a poor country than have no sales in that nation because the price was set too high. According to the World Bank, 1.1 billion humans have a per capita income of $500 per year or less, which is the cutoff for grinding poverty. Some 30-odd nations have per capita incomes averaging less than $1,000 annually. Probably more than 2 billion persons can be described as poor or resource-thin. When it comes to life-threatening diseases like AIDS, with a conservative estimate of 36 million infected—the majority in lower-income nations—how can the international executive balance the need to recoup huge pharmaceutical R&D costs against the need of poor patients? Antiretroviral (ARV) AIDS drugs, which can keep an HIV-positive person alive indefinitely, sell for an annual price of more than $12,000 in rich nations, although the variable cost of producing doses for one person is only $300 per year, as the case reveals. But three-quarters of humankind earns less than $12,000 in one year. Millions of them would die of AIDS-related complications unless the ARV patent holders (such as Bristol-Myers Squibb or Pfizer) agreed to sell the same patented drug at very low prices in poor nations. Initially, to protect their gross margins (on the grounds of supporting R&D costs and preventing the gray market), the patent holders refused to lower their prices. Twelve years later, in 2014, much of the pharmaceutical industry has—with great reluctance—agreed to the principle of global price discrimination. In a recent example in 2014, Gilead Science, a US firm that has patented a hepatitis C drug with the brand name of Sovaldi, sells it in the US for $1,000 per pill. The total cost for the patient or insurance company is $84,000 for a 12-week course of treatment. Op-Ed writers fulminated and tongues wagged, even in rich countries like the US, outraged at the high price. However, Gilead Science has agreed to license the patent to seven generic producers in India at a low enough royalty so that the price of the generic drug to the Indian consumer would be around $2,000 for the 12-week treatment. While $2,000 is a mere 2.4 percent of the US price of $84,000, it is still well above India’s average annual per capita income of $1,170 per person. Managing Reputation and Customer Attitudes Worldwide: How can the pharmaceutical industry justify high gross margins to an increasingly aware and tax-weary public that is already aging in Europe, Japan, and (later) in the US while their tax base is beginning to plateau or shrink? The Role of NGOs and Activist Organizations: Companies have to contend with pressure groups ranging from the American Association of Retired Persons (AARP) to third-world oriented NGOs (e.g., OXFAM) that pressure industries to lower prices or engage in “fair-trade” practices that do not really involve them directly. (For example, Starbucks, a retail coffee shop/restaurant chain, purchases coffee from importers and had little to do with the international supply chain or coffee farmers. But under pressure from OXFAM, Starbucks was forced to render assistance to coffee farmers in far-flung places such as Ethiopia that no Starbucks executive had previously visited. The ARV/AIDS drugs controversy was sparked by protests led by NGOs in South Africa and the United States.) Contract procurers such as Nike or The Gap now pay close attention to labor conditions in factories in Bangladesh or Indonesia that are neither owned nor controlled by the retailer. The Role and Value of the Patent System: Innovation in a capitalist context is motivated by the potential rewards of R&D—namely, a government-conferred monopoly to the patent holder, who can then charge high prices for 20 years (or less). Innovation drives modern economies and high-tech industries that bear the necessary risk-taking of entrepreneurship. An R&D outlay is a form of entrepreneurial risk—a leap in the dark with the final outcome unknown. And yet, there are situations in the pharmaceutical or telecommunication industries where the public interest and public awareness can run counter to the rewards of the patent system and where firms hoping for the “payoff” from their entrepreneurial efforts and patent awards are constrained by regulations and price caps. Influence of Multilateral Bodies Such as the World Trade Organization (WTO), International Treaties, and Protocols: Every treaty or membership in a global industry association brings with it benefits, as well as costs. The WTO started out as a forum for the mutual reduction of tariffs in order to promote growth in world trade. Lower trade barriers increase exports and imports, which are generally held to be beneficial. Today, the WTO has expanded its ambit to include other issues such as intellectual property. According to WTO rules, under the “compulsory licensing” provision, a government can unilaterally declare a medical emergency in a particular disease area (such as AIDS) and suspend patent-holder rights by bringing in generic drug producers in lieu of the patent holders. The generic producer agrees to sell the drug very cheaply at only a small margin over its variable cost since they do not have to amortize sunk R&D costs—and, by the way, may even pay an insultingly small royalty to the patent holder, which only rubs salt into the wound of the patent holder that has lost the ability to charge a high price in that country. While membership in the WTO, or treaties such as North American Free Trade Agreement (NAFTA), brings with it substantial benefits to exporters, many firms incur restrictions and additional costs. Importers in many sectors face heightened competition. Thousands of domestic firms go bankrupt because they cannot compete with imports, as happened in China and India after they signed the WTO treaty and lowered trade barriers. Treaty requirements often mean that a nation agrees to inspection of their industries and economy by outsiders to make sure the country’s companies are adhering to the rules of the treaty. This is anathema to authoritarian governments such as China’s. Nevertheless, gritting their teeth, the Chinese government joined the WTO in December 2001. While thousands of Chinese import-competing firms went out of business, Chinese exports quadrupled in the decade after signing the treaty. Much of China’s economic boom can be explained by its opening its doors to international commerce. At the same time, after 2001, literally tens of thousands of foreign inspectors, NGO personnel, and industry auditors have landed in China and—from the proud nationalist Chinese viewpoint—“snooped” around their nation. Is Globalization Eroding “National Sovereignty”? Are We Headed for a “Goldfish” Planet? Once upon a time, in the year 1648 following an exhausting 30-year war, major European powers signed the Treaty of Westphalia, whereby each agreed that they would not interfere in any other nation’s affairs. What each government did within its own borders was supposed to concern no one outside that nation. No one else would interfere. Thus was born the idea of “National Sovereignty,” which became a dominant concept of international relations around the world for almost three-and-a-half centuries. But in a very quiet way, in the last 30 years the concept of National Sovereignty has been eroding, not so much because of politics, but because of International Business. True, there is the occasional military intervention exemplified by Serbia, Iraq, or Crimea. But the more pervasive erosion of national sovereignty stems from economic interdependence, multilateral or bilateral economic treaties, and the Internet. Tens of thousands of “inspectors” employed by governments or accounting firms arrive at foreign factories, checking for compliance with treaties or global industry standards. Thirty years ago, where I placed the sofa in my living room was nobody’s business but my own. Today, neighbors have the temerity to approach my house, look through my window, and demand that I place my sofa on the other side of my living room, where they think it would be better placed. Thirty years ago I would have told them to “go to hell” on the grounds that what I did inside my own dwelling was nobody else’s business. Today, however, I have to grudgingly listen to my neighbors because I am dependent on them. It is a mutual interdependence. Take the case of the proud Chinese, who are entangled with the US to the tune of well over $500 billion in trade (exports plus imports) each year and who own something on the order of $2 trillion in US assets (such as US Treasury bonds). Every few days, the press reports how Washington lectures Beijing on a range of issues from the value of the Chinese Yuan, to freeing jailed Chinese dissidents, to clamping down on intellectual property piracy. The pressures are sufficiently great that the Chinese have reluctantly revalued their currency by more than 35 percent since June 2005. The Chinese grit their teeth and bear it, occasionally letting out a low growl, and have retaliated by hacking into the data of American companies. Foreigners file suit in US courts seeking redress for issues entirely outside US borders. Courts around the world are tackling cases that originate outside their borders. In 2012, an Argentine naval training ship was impounded in Ghana, based on a court injunction issued in that country in favor of a US hedge fund, Elliot Capital Management, that was owed money when the Argentine government defaulted on its bonds in 2001.The energy dependency of Germany and other large European countries on Russian gas and oil imports explained their tepid response to Russia’s annexation of Crimea in 2014. A quiet but astonishing transformation has taken place in the last three decades in terms of economic interdependence as well as international scrutiny. 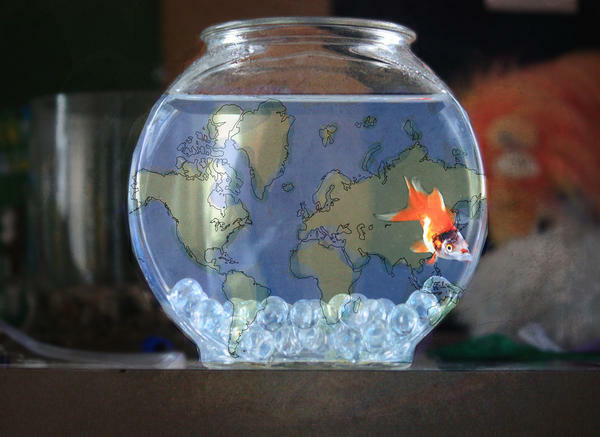 Because of the Internet and social media (nearly 3 billion people are now connected), we may be heading toward a “goldfish planet” where individuals and firms are exposed to a degree that was inconceivable 30 years ago—exposed to foreign ideas, business opportunities, pressures, trans-border regulations, and legal liabilities outside the home state of the multinational company. Borders are increasingly porous to the movements of capital, ideas, and even people, although the “nation-state” with suzerainty over its affairs is still the norm. The planet is still made up of nearly 200 separate fragments (countries and territories). Importantly, for the International Business executive, great differences will continue to prevail across the “fragments” in labor costs, income levels, regulations, and culture. The art of International Business Management and Global Strategy is the ability to sense and arbitrage the differences; to decide on the best method for expansion into foreign markets; to decide for each country on the optimal balance between global standardization and local adaptation; to set optimal prices in each nation; how to transfer “best practices” and good ideas learned from one country to other parts of the firm; and to manage the external regulatory issues and increasingly vocal stakeholders in a “goldfish” environment. International Telecommunications Unions (ITU), Geneva, Press Release, 27 February 2013, ITU releases latest global technology development figures. iPhone 5S Price Index. Prices shown as of November 18, 2013. Official launch of the iPhone5 was in September 2012. The iPhone6 was released in September 2014. Motheral, Brenda, U.S. drug prices 3- to 6-fold greater than other countries, Rx Outcomes Adviser (December 7, 2011). A “gray market” is a situation where the multinational has set prices so far apart in two nations that it pays an independent third party to buy quantities in the low-price nation and resell the item in the high-price country, thereby undercutting the large profit margin the firm enjoys in the high-price nation. For most firms, this is no more than a manageable nuisance. The cost of creating a new drug now $5 billion, pushing Big Pharma to change. (August 11, 2013): Forbes.com. Morgan S., Grootendorst P., Lexchin J., Cunningham C., Greyson D., The cost of drug development: a systematic review, Health Policy. April 2011. Critics allege that because companies do not disclose information, they suspect that an increasingly large fraction of the gross margin ($98 out of $100 in our example) is spent on mass advertising and company overheads, rather than applied to their R&D efforts. World Bank, Regional aggregation using 2005 PPP and $1.25/day poverty line. Global AIDS overview: The Global HIV/AIDS crisis today, AIDS.gov (the actual figure is likely to be much higher because of underreported cases in developing nations). Originally started in 1948 under the name “General Agreement on Tariffs and Trade (GATT),” whose mandate was mainly the mutual reduction of tariffs, the organization was renamed “WTO” in 1995, after which it adopted a much more activist, broader mandate—going beyond tariff reduction to other “non-tariff” issues, such as intellectual property. See Catherine Kolonko, Gilead Signs Deal for Generic Sovaldi in India, HCPLive®, September 24, 2014.